opposition’s collective psyche: with his approval ratings already in freefall, Nicolas Maduro headed into state and local elections in late 2013 facing a certain drubbing. Then, at the last minute, he had a great idea. Inviting people to quasi-legally loot a popular electronics-and-appliances chain of shops would be sure to reverse his fortunes: everybody loves free stuff. The Dakazo was born, the poll slide reversed, however briefly, and the government coasted to another comfortable election win. Just before the Dakazo, the opinion climate was pretty bad: just around 30% of poll respondents said the country’s situation was positive. The state-sanctioned looting of Daka saw a six point jump in this positive evaluation of the country’s situation to 35% – I’ll refrain now from a meditation on how screwed up that is on a human level, for now let’s treat it as data. 35% positives on a country-situation poll-question is decent territory for the government. With the help of its elections machine, and with idiosyncratic factors like that year’s low opposition turnout following the April presidential debacle, 35% was the kind of ball-park where the government could be electorally competitive. But 2015 ain’t no 2013. 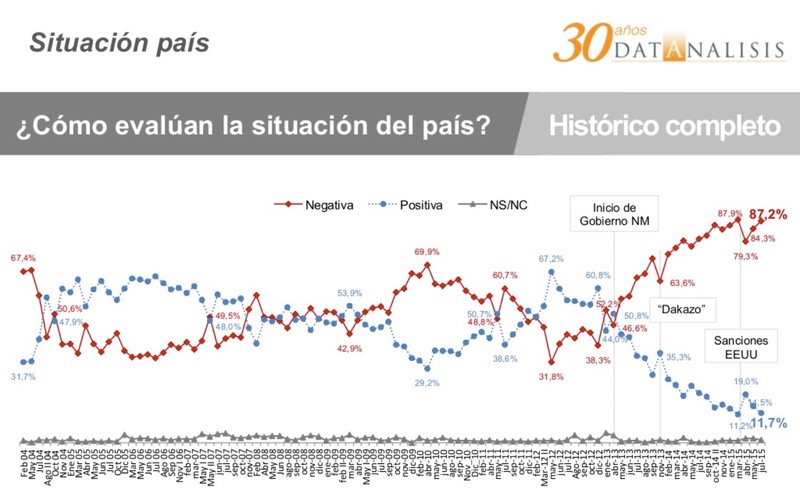 The government starts from a much, much lower base: a dismal 11.7% of people think the country’s situation is positive. Even a Dakazo that adds 6 points to that number only brings it to under 18%. In our Forecasting Tool, that’s consistent with a 100-to-67 opposition landslide on December 6th. Hell, even if the government managed to have a double-dakazo, one that doubled people’s perception of how positively the country is doing, it would still be looking at losing the assembly 96-to-71. So the starting point is realizing just what a dark pit of a Public Opinion Climate abyss the government is starting from. This, I think, remains badly underappreciated by an opposition commentariat beaten into Learned Helplessness by the last 16 years. The government isn’t “a little bit behind” – it’s nowhere near striking distance of being competive this year. And it isn’t surprising. They’ve presided over the implosion of the Venezuelan economy and to the edge of a hyperinflationary precipice. What would be remarkable is if they weren’t light years behind in opinion terms. Even if your theory is that the government can circumvent its deficit with the kind of mass-scale fraud that turns a 50-seat-deficit into a win (and to be sure Venezuela has never experienced election fraud on anything like that scale) you have to wonder: with what manpower? Fraud in Venezuela is a labor-intensive, center-by-center process. 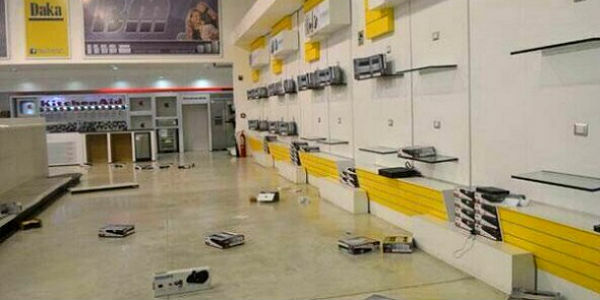 The chavista machine is reeling from the economic collapse as much as anyone else. You can’t answer a toque de diana if you’re standing in line for milk.